By The Ohio Chemical Manufacturing. Co. Dated 3-44. Size medium. The mask looks good and is lovely and flexible retaining good shape. The only downside is a small tear in the rubber harness where the press stud has pulled through (see photo) and a tiny nick where the nosewire has come through slightly. The rest of the harness, both webbing and rubber parts, are very good, and the original oxygen hose, complete with end connector is excellent. 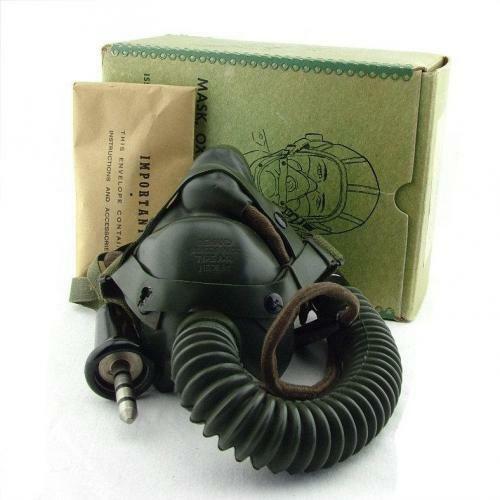 This mask is fitted with a rare T-44 microphone assembly. This comprises a deep chocolate coloured loom (CO-287) with an American version of the standard RAF bell jackplug to one end and a Type T-44-A magnetic microphone and AAF JK-26 socket at the other. The T-44 fits inside the nose section of the mask alleviating the need for a throatmicrophone. Used primarily in aircraft fitted with RAF radio equipment, this loom enabled AAF crews with the 8th and 9th AAF to plug their American made headgear into RAF aircraft. The standard AAF helmet jackplug connecting to the JK-26 and the bellplug to the aircraft. The mask comes with a 'Juliet' head harness so that it can be worn without a flying helmet. It comes boxed (marked 'small' and dated May '45) with internal card portion and original cellophane (fragile). The box contains the spares envelope with straps, studs and screws plus a 'flat hook' and general instruction leaflets, plus others for the positive lock disconnect assembly and 'eyelet instructions'. An excellent and rare set-up. Stock code O21233.